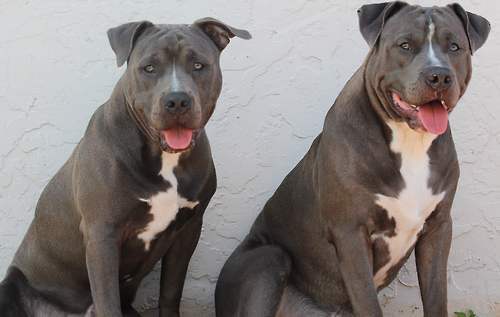 American Pit Bull Terrier (APBT) is a medium-sized, solidly built, short haired dog whose early ancestors came from England and Ireland, bred from Bulldogs and Terriers in 19th-century Britain. It is a member of the molosser breed group. American Pit Bull Terrier was bred as an all-around farm dog, working the farms as a cattle/hog dog. Being intelligent, athletic dogs, American Pit Bull Terriers excel in many dog sports, including weight pulling, dog agility, flyball, lure coursing, and advanced obedience competition. The American Pit Bull Terrier is both powerful and agile. Actual weight and height are less important than the correct proportion of weight to height. Nicknamed Yankee Terrier, Pit Bull Terrier, Half and Half, and American Bull Terrier, the breed has long been admired for its tenacity, courage, agility and spirit. American Pit Bull Terrier coat is short, single layered, and stiff but glossy. The ears are rose colore and semipricked and eyes can be almost any color except blue. The blocky head is wedge-shaped with wrinkles on top. Decades ago, the Pit Bull was known as a much loved, much trusted, worthy companion. Training for the American Pit Bull Terrier is extremely important to help the dog become the best family dog he can be. American Pit Bull Terriers are believed to possess more human-like qualities than any other breed. They have a natural propensity to be aggressive towards animals and other dogs, but they are not aggressive towards people or their families. Congenital heart disease and hHip dysplasia is about the most serious problem at American Pit Bull Terrier. The United Kennel Club standard for the American Pit Bull Terrier is rather sparse. The dog is square and powerful with a blocky head, prominent cheeks and jaw, and taut, muscular body. He has a deep chest, and a short, glossy coat of any color. His ears may be cropped or not. Size can range from 30- 50 pounds for females and 35-60 pounds for males.